Today’s recipe is very special to me because this is one of my all-time favorite soups! Seaweed soup with mussels, or honghap miyeokguk in Korean. I was born and raised on the seashore, so I love all kinds of fish and seafood: this dish combines the healthy, delicious flavor of dried seaweed (miyeok) with the fresh, meaty, irresistible taste of mussels. The resulting soup has all the best flavors of the sea, is good for you, and is totally addictive! 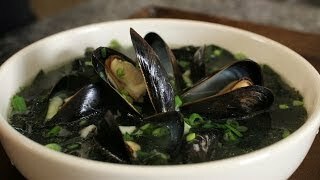 Some people like to remove the mussels from their shells before cooking this soup, but I think the shells add something special and earthy to the broth, a deep sea flavor that can’t be replicated any other way. There are many different miyeokguk recipes in Korean cuisine, made with oysters, fresh cod, beef, clams, abalone, scallops, shrimp, or beef like I did years ago in one of my early videos. 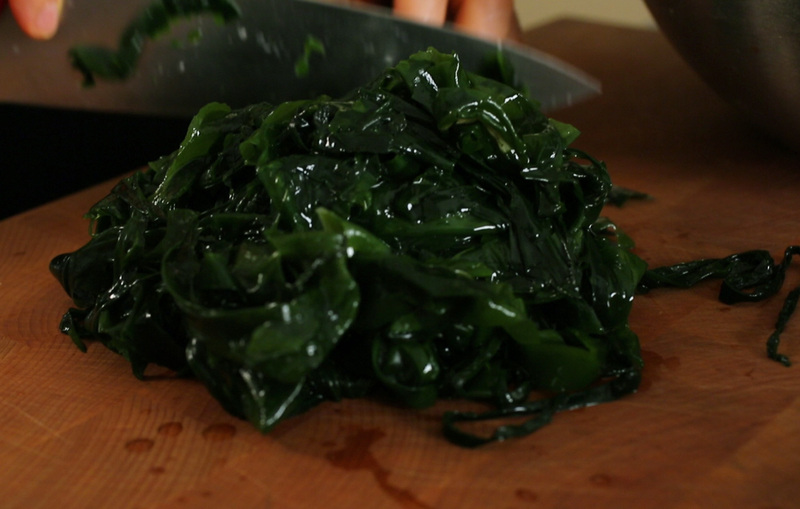 This is because miyeokguk holds a special place in Korean culture, as the high levels of calcium and iodine in seaweed make this dish an ideal one for nursing mothers recovering from childbirth. Many new moms eat it for a month straight after giving birth. Because of this it’s also customary for Koreans to eat this soup on their birthday, kind of like the western birthday cake – everyone knows that it’s not really your birthday until you have a bowl of miyeokguk. The nicest thing you can do for a Korean on their birthday is make them a bowl of miyeokguk. They’ll never forget it! But you don’t have to wait until your birthday, or until you’re pregnant, to enjoy miyeokguk! Many Koreans (especially me!) enjoy this soup year ’round! Enjoy the recipe! This was a special video for me to film, because I got to eat miyeokguk afterwards. And then when editing the video, it looked so delicious that I made miyeokguk again lol! If you make it, be sure to let me know how it went, and upload a photo of the finished dish! 2 pounds fresh mussels, debearded, rinsed, and drained. Mix 1 tablespoon salt and 4 cups cold water in a bowl to make a salty brine. 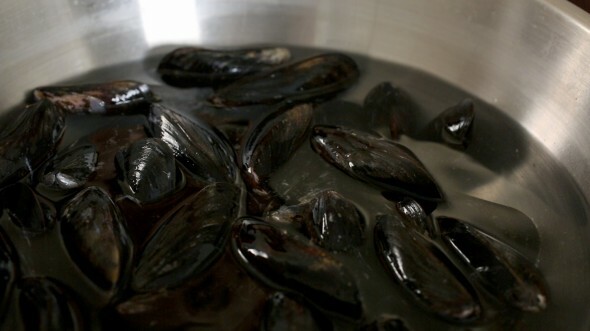 Add the mussels and soak them for 30 minutes, so they spit out any sand or dirt. Drain and rinse in cold water. Drain. Drain the miyeok and rinse and drain a few times. Squeeze out excess water and cut a few times into bite sized pieces. Add the miyeok and 8 cups of water to a large heavy pot. Cover and cook over medium high heat for 20 to 25 minutes until the miyeok turns soft and the water is infused with its flavor. Open and add the mussels, garlic, and fish sauce. Stir a few times. Cover and cook about 15 minutes over medium high heat. After a bit of cooking the mussels will open up and the broth will become infused with their sweet flavor. Drizzle 2 to 3 teaspoons sesame oil over top, ladle the soup into serving bowls and sprinkle some green onion over top. Serve immediately with rice, kimchi, and a few more side dishes if desired. Posted on Thursday, May 29th, 2014 at 4:18 pm. Last updated on April 26, 2015. Posted October 27th, 2016 at 10:38 pm | Log in to reply. I just made some kimchi, but used mussels instead of oysters, and now I have all these mussels left over, and I just happened to have hoarded some miyeok a few months ago, because I love it so much. Guess what I’m going to do with it all!?!? The fact that this is your favourite has me very excited to try!!! Posted September 7th, 2015 at 7:13 am | Log in to reply. Hi Maangchi, I’m planning a menu for a good friend who is going to deliver her baby next week. We’re both here alone in Australia without our mum’s for this event and I’d like to feed her something nutritious. I’m gonna make this soup for her to take to the ward. Can you make up a postpartum menu for my friend? Thank you! Posted September 7th, 2015 at 9:38 am | Log in to reply. This is such a good idea to prepare this food for your friend who will have a baby. Posted September 28th, 2014 at 7:54 am | Log in to reply. Love your site! I’ve been using your miyeok gook recipe for years and everyone loves it, especially the kids. 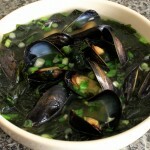 Question: if I only have frozen mussels without the shell, will it affect the recipe very much? Posted September 28th, 2014 at 11:38 am | Log in to reply. It should be ok but I would use more of them. Good luck with making delicious miyeokguk! Posted June 13th, 2014 at 7:02 pm | Log in to reply. I am excited to try to make miyeokguk tonight! I will use clams instead of the mussels. How would you call this soup made with clams? Posted June 14th, 2014 at 11:02 am | Log in to reply. Posted June 9th, 2014 at 7:46 pm | Log in to reply. Posted June 11th, 2014 at 11:29 am | Log in to reply. Thank you for mentioning my recipe on your blog. Good luck! Posted June 6th, 2014 at 5:22 am | Log in to reply. Oh I am craving miyuk gook now! I agree that it has a calming effect. I feel so calmed and soothed whenever I eat miyuk guk. I have tried poorly made ones before too! But when made properly, it’s sooo yummy. I don’t like my mom’s miyukguk much, but she always makes it for us on our birthdays. She makes it out of love, so how can we not enjoy it?! Posted May 30th, 2014 at 1:58 pm | Log in to reply. I happen to have frozen mussel meat and seaweed which was meant for miyukguk, so the timing was uncanny! I decided to make this version last night and it was really yummy – very much the memory of the sea….But I reduced the amount of water because I like my soup a little stronger. Very happy with your recipe! Posted June 11th, 2014 at 11:30 am | Log in to reply. yay, memory of the sea! “I reduced the amount of water because I like my soup a little stronger.” awesome! Posted May 29th, 2014 at 6:09 pm | Log in to reply. What other seafood can you use instead of mussels or clams? Posted May 29th, 2014 at 6:53 pm | Log in to reply. Sorry Maangchi. Your answer is writtten above. I can use any kind of seafood and meat. Can’t wait to try this seaweed soup because I love seaweed. Posted May 29th, 2014 at 9:36 pm | Log in to reply. This recipe was originally posted on May 29, 2014 at 4:18 pm by Maangchi. It was last updated on April 26, 2015. The video was watched 387,894 times on YouTube & has 6,081 likes!